Tonight’s Mexican clash between Saul “Canelo” Alvarez (49-1-1, 34 KOs) and Julio Cesar Chavez Jr. (50-2-1, 32 KOs) was supposed to have been an exciting affair on HBO PPV, but instead it turned out to be even worse dud than the Floyd Mayweather Jr. vs. Manny Pacquiao fight from 2015. Indeed, Mayweather-Pacquiao was exciting in comparison to the Canelo-Chavez Jr. fight on Saturday night. The judges scored it 120-108, 120-108 and 120-108. Chavez Jr. started off throwing zero punches in the early rounds. 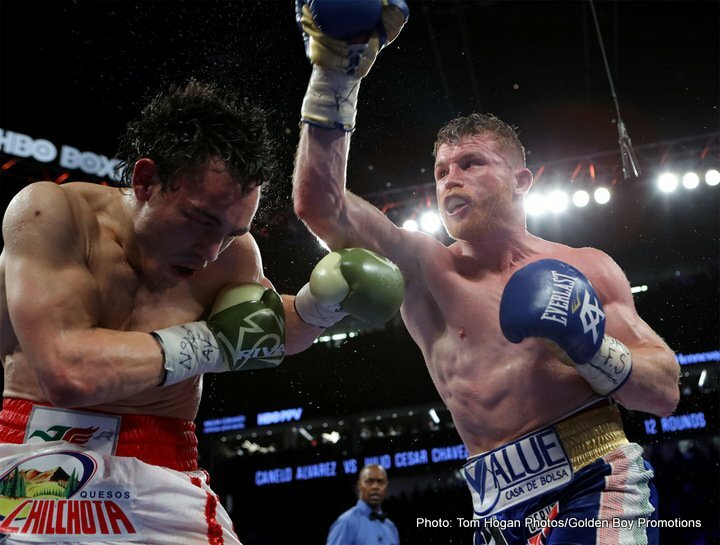 Chavez Jr. increased his punch volume when Canelo gave him a break by backing up to the ropes in round 6. This was something I believe Canelo did because the fans were booing the fight like mad. Canelo had to do something to try and entertain the fans and to get Chavez Jr. to start throwing punches, because he was throwing no punches at all. It was mind boggling to see Chavez Jr. just standing there and taking shots without throwing anything back. It wasn’t that Chavez Jr. purposefully wasn’t throwing. It was more of a case of him being so weight drained and emaciated looking from draining down to make the 164.5lb catchweight for the fight. Chavez Jr. had nothing left after making weight. He looked ill. If you like watching someone workout on a punching bag for 36 minutes, then you loved tonight’s fight, because that what it was. As many boxing fans predicted, Chavez Jr. was too weak from making the overly strict 164.5 pound catchweight for the fight, and he had zero strength after he rehydrated. As soon as the emaciated looking Chavez Jr. stepped inside the ring before the fight started, it was obvious that he was going to be too weak to fight. Bravo to Golden Boy for getting Chavez Jr. to agree to the catchweight because it ensured that Canelo would win a one-sided fight, but I think the move backfired on the promotional company because it was such bad fight that the boxing fans at ringside booed the lack of competitive action. The Mexican fans celebrating the Cinco de Mayo wanted to see a competitive fight between two of their heroes. They didn’t see that tonight, because Chavez Jr. was too weak for him to compete. Canelo was the only one throwing punches, and it looked like he felt sorry for Chavez Jr. and let up on him by the 6th. It was that one-sided. Canelo looked like he didn’t want beat Chavez Jr. too badly because he WASN” T THROWING ANY PUNCHES. It was pathetic, and yet so predictable. Anyone could see this was going to happen as soon as the catchweight requirements were announced for the fight. You’re going to take a fighter that can’t even make 168 and require that he fight at a catchweight of 164.5. That was plain stupid. I wouldn’t have made that move if I were Golden Boy because I would have known that I would be giving the boxing public a bad product in having Canelo beat up on a weight drained Chavez Jr., and that’s exactly what happened. There was some good news after this dud of a fight, as Gennady Golovkin came into the ring and it was announced that he would be fighting Canelo in September. It’s unknown weight the fight will take place at. I hate to even speculate, because Canelo has been fighting at catchweights steadily since 2013. He’s only had one non-catchweight fight in the last 4 years, and that was against Liam Smith. Presumably, Canelo will be fighting Golovkin at 160. If tonight is any indication, I think Canelo is going to have major problems, because he clearly doesn’t punch at the middleweight level. His power was no impressive at all. Canelo’s power looked like junior middleweight level power. I think there are bigger punchers than Canelo at 154. Against Golovkin, Canelo is going to be totally destroyed. I don’t see it as a fight. ”Triple G, you are next, my friend,” said Canelo after the fight. ”Yes sir, it’s done,” said Canelo. You are here: Home / Boxing News / Results: Canelo Alvarez defeats Chavez Jr, fans BOO!